Higher adsorptive capacity relative to conventional media results in smaller space requirements to achieve equivalent phosphate uptake. Read all instructions before use. The use of a mechanical pre-filter to remove particulate organic material from water prior to its interaction with this media will improve efficiency. Rinse Xport PO4 Cubes in purified water or low-TDS fresh water, then place media into a clean pail and fill with water from the aquarium into which the media is to be placed. 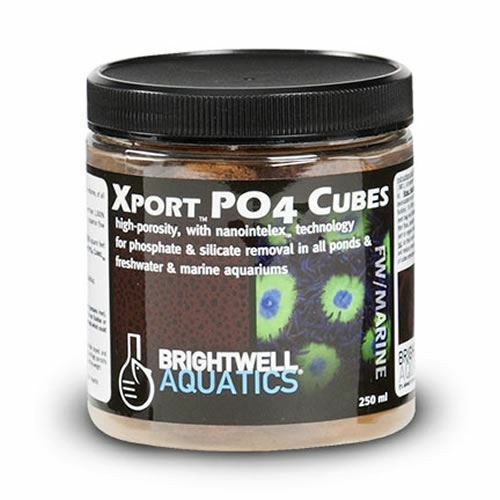 At an initial phosphate concentration of 1 ppm or less, 350 g of Xport PO4 Cubes is capable of extracting ~10.5 g of phosphate; this equates to 1 g of Xport PO4 Cubes per 396 US-gallons (1,500 L) to eliminate 0.02 ppm phosphate. Replace media when phosphate concentration ceases to decrease (if greater than 0 ppm) or begins to increase. In low-nutrient aquaria, it is not uncommon for several months to pass before the media has become exhausted. If corals or other invertebrates appear to react negatively to the use of the media, it may be an indication that reactive phosphate is being removed too aggressively; decrease amount used by 50% and continue use until phosphate concentration appears to be immeasurable. 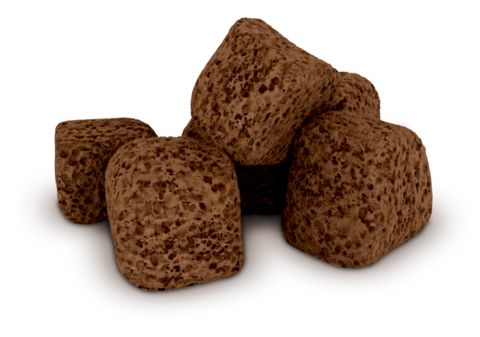 The most efficient use of Xport PO4 Cubes will rely upon regular testing for phosphate with an accurate test kit to ensure that the mass of media being employed is suitable for the system requirements. A flow-through rate of 1 - 3x the total aquarium volume per hour is recommended. Do not fluidize; fluidization serves to decrease filtration efficiency and may cause gradual deterioration of the material, potentially resulting in dispersal of harmless, but unattractive, dust throughout the system. Canister filtration: Load Xport-PO4 into filter cartridge as directed by filter manufacturer. Passive filtration: Place Xport PO4 Cubes loosely in an 800µm mesh filter bag and locate in an area of low- to medium-flow. Media reactors: If placing Xport PO4 Cubes into a media reactor, ensure that the media remains "static" and non-moving.